David Isaacs, SCA Visiting Professor of Screenwriting has worked as a TV and Screen Writer and Producer for over 35 years. He has been credited as a writer, co-producer or creative consultant on M*A*S*H*, Cheers, Wings, Frasier, Becker and Mad Men. He co-created and executive produced the series Mary, Big Wave Dave's and Almost Perfect for CBS. His writing credits also include episodes of The Simpsons, The Tracey Ullman Show, The Jeffersons and The Tony Randall Show. Over the course of his career he has been involved as a writer or producer in over eight hundred episodes of TV comedy. Screenwriting credits include Volunteers, starring Tom Hanks and John Candy, and uncredited re-writes on Mannequin, starring Andrew Mc Carthy and Kim Cattrall and Jewel of the Nile, starring Michael Douglas and Kathleen Turner. 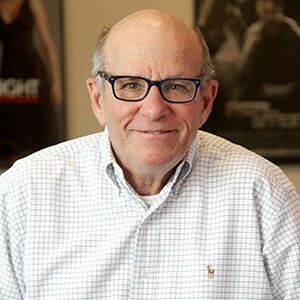 Isaacs has been nominated eight times for the Writers Guild of America Award and won three times for Cheers and Mad Men. He's has six Emmy nominations with one win for co-producing the first season of Cheers. He's also has been nominated for the Humanitas Award and received a Peabody Award as a member of the staff of Frasier.